Northern Ireland U21s remain winless in the Euro 2017 qualifiers after France struck late to clinch a 1-0 victory. Substitute Enzo Crivelli converted a pass from Georges-Kevin N'Koudou eight minutes from time to grab all three points in Guingamp. 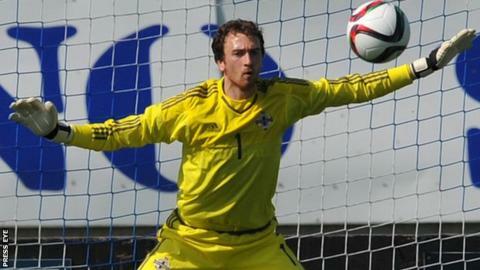 France dominated and Northern Ireland keeper Conor Brennan was in top form to keep the score down. Adrien Rabiot hit the woodwork two minutes from time and Shay McCartan saw his side's only serious attempt saved. Jim Magilton's team were were beaten 2-1 by Scotland in their opening qualifier and drew 1-1 with Iceland before losing 2-1 to Macedonia. Magilton was bolstered by the return of Ryan McLaughlin and Luke McCullough from Michael O'Neill's senior squad, the latter captaining the side. Sebastien Haller, Rabiot and Corentin Tolisson were all denied by Kilmarnock stopper Brennan.